An evening of celebration, culture, and (making) connections! Groove to music from Ecuador, learn about our Sister City relationship, and find out how you can be part of the fun! 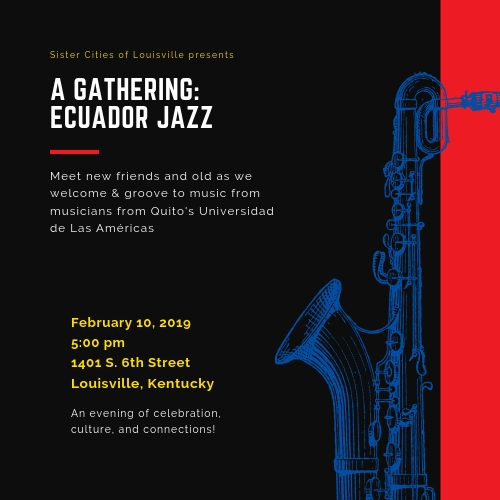 Join us for a concert and evening of celebration, culture, and connection-making as we welcome students and faculty from Quito’s Universidad de Las Américas (UDLA) to Louisville. The Schools of Music at both the University of Louisville and UDLA are running an exchange program with students and faculty; UDLA students are in town to participate in UofL’s JazzFest and perform in local schools. The kick-off celebration is Sunday, February 10th 5-7:30p in a private home in Old Louisville (1401 S. 6th Street). Short presentations on the history of the Louisville-Quito sister city relationship and general information in Ecuador precede the concert. All tickets include concert, wine, and small bites. Tickets are $10. Hurry now - tickets are limited to the first 75 people!